Call me childish, call me narrow-minded, call me a “blockbuster-junkie”, call whatever-you-want, but to me this is the perfect film! Such a bold statement might require some explanation (which hopefully I will be able to give in this post) and certainly begs the question: what makes a film perfect? And, is this really one? The answer to the second question is a simple and resounding YES. I believe a perfect film is one that can be watched over and over again: a film that you never grow tired of and that whenever is on TV and you stumble across it, you end up watching. A perfect film is one of those where you struggle to pick up one favorite scene, because they’re all so good. A perfect film is one of those you really wouldn’t change anything about it and where all its elements (story, direction, acting, music, cinematography, editing and so on) come together in a such a way that it’s virtually impossible to choose one over the other. Raiders of the lost Ark is 30 years old this month, but still shines as if it were made yesterday… except that it wasn’t because, as we all know “they don’t make them like this anymore“. I still remember going to the movie theatre when it first got released (Yes, I’m giving away my age: clearly I’m not a teenager!) and being absolutely blown away by it. At the time there was nothing like it (and arguably, that’s probably still true today). Ever since then people have been trying to imitate its winning formula, and, needless to say, most of them failed miserably. Just to give you an idea of what I am talking about (and to prove my point), just think of Lara Croft, Prince of Persia, National treasure, The Mummy Trilogy and even those films inspired by the Dan Brown‘s books: well, those are the most successful ones… Enough said. I won’t even go into the list of endless B-movies. I find quite hard to write about “Raiders”, mainly because I’ve seen it so many times and I know so much about it, that I almost feel compelled to write every single details filling up pages and pages… But don’t worry, I won’t. 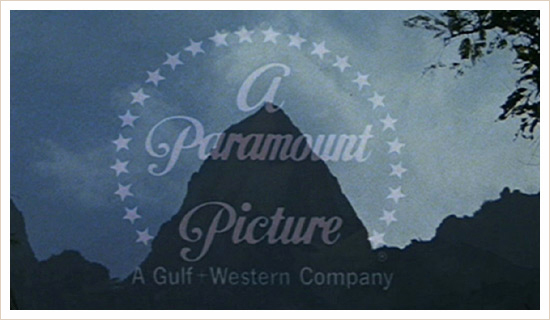 Right from the word “go”, from when the summit of the Paramount logo dissolves into a Peruvian mountain (a Visual device which will become the trademark of the entire series), you know you’re in for something which is not only original but clever and handsomely made. And I haven’t even mentioned the hero himself, Indiana Jones. Harrison Ford deserves a lot of credits for the success of this film. Who knows what would have happened if Tom Selleck had played the role: he was the first choice, after all (I will be eternally grateful to Magnum PI). Harrison Ford manages to make Indiana Jones strong and frail at the same time, funny and sad, invincible and weak. Indy is a hero but he gets hurt, tired, dirty and sweaty. It doesn’t matter how far-fetched and over-the-top the action might be, Ford makes it feel real. Spielberg directs it all with clockwork perfection but he’s also able to improvise on the spot and use it all to his advantage (most famously, the now-classic scene where Indy shoots the sword-man, which as we all know by now, was pretty much improvised on the spot). He orchestrates it all with a mastery that’s never showy and always serving the story and the action as he uses all the tricks in the film-maker book: long lens shots during a chase sequence, a tracking shot across the desert to show the scale of the landscape, a single one-take shot during a drinking competition. He also knows exactly how to pitch the film: helped by a carefully crafted script, all the improbabilities are always levelled by humour, the action is always counter-balanced by actual dramatic scenes, the magical sense of wonder is always routed to reality and however cartoony some of the characters might be, they’re always incredibly detailed. What started off as a tribute to those Action Saturday Matinee that Spielberg and Lucas loved so much, here becomes a rollercoaster of sheer invention, cracking action and incredible fun. So many scenes are now become classic iconic moments in movie history, whether it’s to do with snakes in “well of Souls”, or ghost-like creatures during the opening of the ark, running though the streets of Cairo, or fighting with a bald guy by a plane out of control, in a secret chamber underground, or in a massive warehouse with thousands and thousands crates (incidentally, one of the best “last shots” of any movie!!). This is so much more than just pure escapism: this is a manual of “storytelling with pictures”. Here’s there’s a great fan-made running-commentary of the film. A real work of genius and love for the film made with great care and attention. Well done Jamie! Raiding The Lost Ark: A Filmumentary By Jamie Benning on Vimeo. I agree 100%!!! I first saw the film in L.A 30 years ago when I was 19, and it was without doubt the best film I had seen. I came back to to the UK and dragged a whole load of friends to see it a month later. Everyone agreed it was a brilliant film and still is…. but we all love you for this – and we all love INDY!! It’s true. This is one of those movies where everything just “came together”. Raiders is smart in all its over-the-top silliness, and brutal, yet cheeky in all its action and adventure. I do admit to enjoying some of the imitations like Tomb Raider and Prince of Persia, but none compare to this ingenious film. Truly, if a movie deserves to be celebrated thirty years later, it’s this one! I was probably eight years old when I first saw Raiders (unfortunately, I wasn’t born yet during its theatrical run, so I had to catch it on VHS) and I remember some of this movie terrifying me as a kid! The Ark of the Covenant’s face-melting, Nazi bruisers getting diced in propellers, and the various grisly scenes within the intro and the Well of Souls were some of the most grotesque stuff I’d seen at that point in my life (and that’s before I saw the even more graphic Indiana Jones and the Temple of Doom a few days later!). I apparently wasn’t the only one either, since the protests from parents and critics towards the PG rating actually motivated Spielberg to tell the MPAA to overhaul the rating system if they don’t like the graphic content, which they did, and thus was born the American PG-13 rating. Just another way that Raiders made history! Having re-watched the movie as an adult though (in fact, I think I’ll do it again in honour of the occasion), I can definitely appreciate how it is, as you say, “a perfect film”. I agree. This movie created a whole generation of adventure filmmaking, and I’m sure it will eternally continue to inspire other films in this same vein as well, even if it’s the original that will be most classic and most fondly remembered. It seems that most movie lovers have a special place in their heart for Raiders, and I, too will continue to carry mine! Happy anniversary, Indy! Great review. It must have been difficult to hold back on so many other points that could have been made about why this film is so great though. They really just don’t make them like this anymore, or maybe they never did when you think about it. Ever since seeing Raiders of the Lost Ark for the first time at the impressionable age of 9 years old I have compared every other so called action movie to this one and nothing comes close. The soundtrack alone is an epic adventure. Every instrument constantly works to punctuate a memorable moment of the movie so vividly you can actually see it playing in your head as clear as if you were watching it at that very moment. Absolutely everything about this movie is perfect. With that I agree 100%.